Call to schedule a pick up or delivery. CopEx started in 1989 with a truck and a barn for a warehouse. 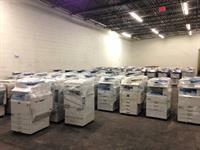 We serviced copier dealers throughout New England and upstate New York. Our original idea was to exchange trade-in copiers between dealers for a fee. Thus was born “The Copier Exchange”, now known as "CopEx Inc."
We soon realized that the mix of brands was insufficient to accommodate all the exchanges and so began to buy and sell as well. Years later we have two warehouses, a fleet of our own vehicles, and hundreds of customers across the globe. Our goal is to provide the full spectrum of used and off-lease office equipment to our customers. The key to our business is accurate representation. Not every machine is a “creampuff”, but that’s OK. What is important is that we call a creampuff a creampuff and a parts machine a parts machine! We are so confident in our representations that we offer a money back guarantee on all our equipment. • Will Buy all your used and off-lease office equipment. • Provide lease return shipping service at an affordable price. • Provide fair market quotes on equipment you hope to trade in. • Offer a locator service to help you find the machines you need. Call 888-972-6739 today for more information!